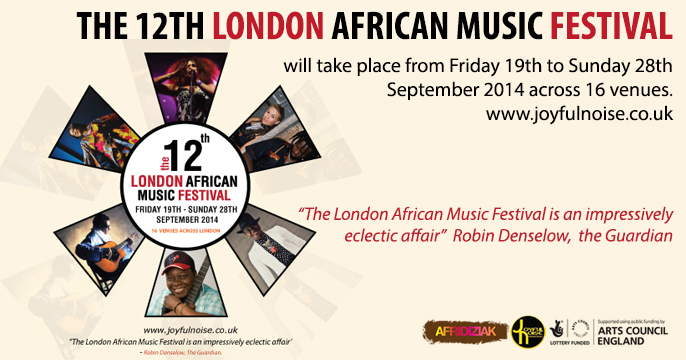 The 2014 London African Music Festival will again run for 10 days, across 16 venues across London, produced by 10 producers under the direction of founder Biyi Adepegba of Joyful Noise. 2014 line-up: This year’s festival features the likes of BOMBINO (Niger), SEKOUBA BAMBINO (Guinea), KANDA BONGO MAN (Congo), vocalist GHALIA BENALI (Tunisia), RISE KAGONA of Bhundu Boys fame (Malawi), KING AYISOBA (Ghana), vocalist COCO MBASSI (Cameroon) and violist SAMY BISHAI (Egypt). Making their London debut are Malian singer MAMANI KEITA (Mali) and Swedish/Senegalese couple SOUSOU and MAHER CISSOKO. AFRI-KOKOA presents DIRECTION AFRICA featuring DJ FRANK GOSSNER (VOODOO FUNK RECORDS) + AFRI-KOKOA DJs AJ KWAME and BAGGY. Two mainstay of British-African music guitarist ABDUL TEE-JAY (Sierra Leone) and pianist Juwon Ogungbe (UK/Nigeria) play solo in the afternoon at the Green Note Club. The British-Ghanaian funk band YAABA FUNK and Nigerian afrobeat band THE RHYTHMS are two bands that know how to put the funk in the grooves adding to the ten days of wonderful music.